International community usually considers Israeli wine as the "New World’s Wine". In fact, Israel owns the oldest history of wine production. From the biblical era, there were record for grape growing and wine history. According to archaeologists, more than 2000 years ago, there was a considerable size of the wine industry in Israel. During Roman times, many vineyards were destroyed and the wine industry suffered a severe hit. Moreover, during the regime of Muslim, the wine ban was promulgated and the wine industry was all stopped. This situation lasted for over 1200 years. In ancient times, the traditional Israeli wines were strong and sweet, which are very suitable for the taste of the Israelis. The formal start of the modern wine industry in Israel began in 1882, when Baron Edmond de Rothschild established two wineries in Israel, the Israeli wine industry got revived. Israel is located on the Mediterranean coast. The unique Mediterranean climate is the key to brewing wine. The Mediterranean climate is the sole climatic type that rainy season and hot season are not at the same time. Therefore, the summer of Israel is hot and dry, so the water evaporates violently, which make the sugar of the grapes keep being accumulated. In addition, the narrow land makes Israel has several different terrain areas: coastal plains, northern mountain plateau and southern desert areas. The temperature difference is also easy to make fruit sugar accumulated and increase sweetness. The main varieties of grape varieties grown in Israel are mainly international breeds: Carbenet Sauvignon, Riesling, Sauvignon Blanc, Gobalt Leaf, etc., which are very abundant. At present, there are five main vineyards in Israel: Galilee, Samson, Judean Hills, Negev and Samaria. The total area of the vineyards in Israel is about 5,500 hectares, of which more than 80% of the vineyards are located in the Samaritan, Samsun and Galileo areas. The position of red wine in Jewish religious culture is important, whether it is in the Sabbath, festivals, weddings, circumcision, bar mitzvah remark or other religious rituals. Unlike other liquid drink, red wine has a special prayer for the ceremonies. In Jewish history, there is an interesting story about the grapes. According to Hebrew Bible Numbers, Moses sent 12 spies to Canaan to nose for the situation. Canaan is the Promised Land to Abraham and his descendants, which was occupied by a sturdy tribe at that time. Ten of the twelve spies brought back a negative report. Only Joshua and Caleb came back with huge grapes, hoping to bring the hope of the Israeli to conquer Canaan. Nowadays, in many Israeli wine cellars and bottles, you can see the picture that a spy is carrying huge grapes. There are many special cultures related to Israeli red wine, one of which is the fallow of the land. In Israel, other crops cannot be planted with grapes in the same area. The cultivated land needs to be fallowed once for every seven years, only aiming at growing better grapes and brewing better wines. According to the Bible, the land must have its sabbath as well as man, and so every seventh year was to be fallow year for the ground. People cannot cultivate the fields nor overhaul the vineyards. Based on the strict fallow system, Israeli wine industry can be everlasting and produce high-quality wine. Jewish has a religious requirement for the red wine, which is to comply with "Kosher". Every major Jewish festival, the orthodox Jews will open a bottle of "Kosher" to celebrate. So how to recognize the wine is "Kosher" or not? When you see one of the following four signs on the bottle, that is to say, this bottle of wine from raw materials to the production process is in full compliance with Kosher. Israel's modern brewing process is almost fully mechanized. Grape separation, pressing, fermentation, storage and filling are all completed by the assembly line. In addition to the high-tech methods, Israeli wine industry is also well aware of the importance of winemakers. Many winemakers are graduated from Israeli universities and major in enology. They have been specially trained in California, Australia and France for a prolonged period to increase experience and knowledge. The winemaker supervises the entire process of wine production, understands the characteristic of each wine, and even has the right to control product types according to the quality and yield of the grape. With skillful technology and experience, the winemaker adjusts the grape fermentation time and temperature to ensure that different varieties of grapes can brew different flavors of wine, which also maximize profits of winery. The improvement of the quality of the wine also led to the development of Israeli wine culture. With the growing popularity of wine tasting, wine culture classes are held every corner of the world. The winery also introduced the wine production process and wine tasting as a newly developed tourism project, attracting many tourists. Israeli wines are exported to 40 countries on 5 continents, and most of them are exported to the America and Western Europe. Experienced the technological innovation of the quality, Israeli wine industry has been fully upgraded and internationally recognized. Robert Parker, a famous wine critic wrote: "The wine of Israel has been changing in a good way, some of which can directly use" excellent "to describe. Wine critic Oz Clarke also mentioned: "The Israeli wine industry is a rising star of the international wine industry." Adir Winery is a family business located in the heart of Upper Galilee. The quality of the soil and superior climatic conditions of Kerem Ben Zimra Plantation make the quality of the wines outstanding and loved by people. Since the establishment of Adir Winery in 2003, it always maintains the highest level of wine. From planting, harvesting, crushing and bottling, all steps are defined and controlled by the highest professional standards, producing great reputation of the national wine. Now it has become Israel repeated Award winery. The “a” series by Adir Winery is a blends series of red and white wines are made with a special blend of grapes, each grown and harvested along the slopes of the vineyard’s unique plateau. To create the perfect balance, each variety is planted and harvested at individual times, adhering to the specific attributes and requirements of every type of grape. 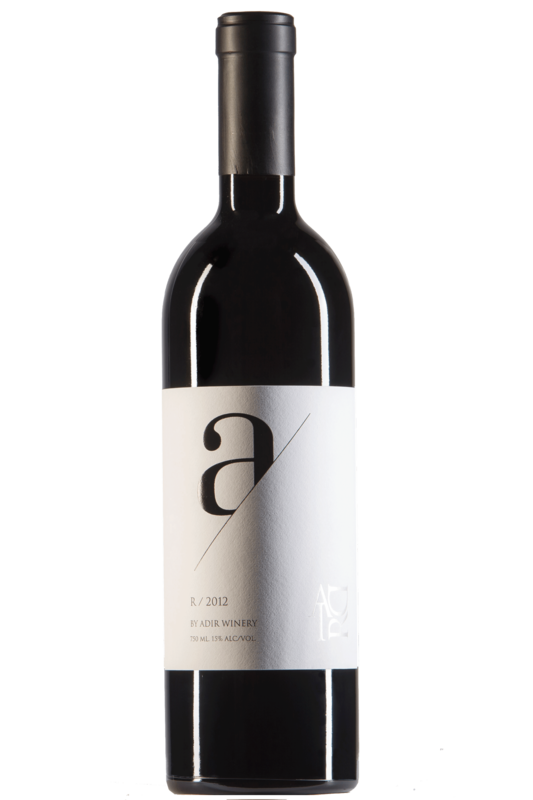 The “a” series is specially created annually by Adir Winery’s expert wine maker, making use of the season’s harvest to create the perfect blend. This individualistic approach ensures that the distinct taste of “a” is achieved, serving as a select wine created exclusively at Adir Winery. “a” wines are made with the utmost care and application of meticulous methods. Manually harvested, the clusters are always hand selected, ensuring that only the highest quality grapes are chosen and incorporated into the wines. Following harvest, the grapes then undergo light pressing and non-extraction to maintain the free run of the juice. The next stage is the fermentation and soaking of the peels, using a special yeast solution for slow and cold fermentation. Full fruit extraction and its maximum potential are achieved, combined with the optimal alcohol content which enhances the fruit taste. These unique blends have a rich bouquet of tastes, and can be enjoyed on its own or alongside a meal. It presents a wide variety of seasonings to the palate, and easily complements food without overburdening. “a” is a signature Adir wine, uniquely produced and savored by all, every year and all year round. a/r -The shades are: red-black – dark blue and opaque the wine has a rich bouquet of concentrated black fruit, touches of cassis, Vanilla, tobacco and cigars. a wide variety of seasonings, a few fresh greens, medium to full bodied and dominant but not controlling wood. a pleasant sweetness and a very continuous ending. A complex wine possessing the ability to mature for 8 years. The Kerem Ben Zimra series is of high quality, aroma and offers a unique combination of tastes. Grown along the slopes of the vineyard’s special plateau and harvested during the early morning hours, these wines are aged in French and American oak barrels for 12-14 months, followed by an additional five months after bottling. These wines incorporate a distinct variety grown in our region, they benefit from the unique regional climatic conditions and selective production process which has become an inherent characteristic of Adir Winery. The outcome is apparent in every bottle. Kerem Ben Zimra wines are easy to drink and offer a highly pleasurable experience. These wines combine a blend of tastes to produce a light and enjoyable flavor suitable for many occasions. C.S. The shades are: red- purple – dark and opaque. The wine has a rich bouquet of ripe red and black fruits, black plum ,red raspberry ,blueberry ,clove, and a balanced bouquet of coffee and cacao ,seemingly sweet , powerful tannins and a pleasant ending, an elegant wine possessing the ability to mature for 5 years. The wine has a light straw color verdant and shining. 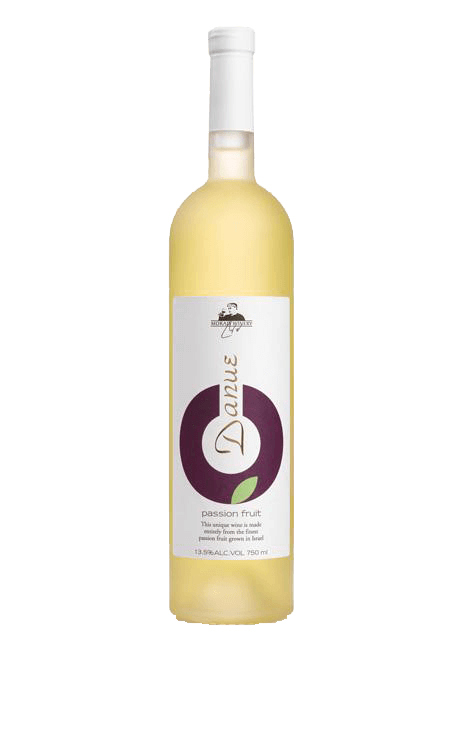 A restrained and complex bouquet with hints of grapefruit, pineapple, grass and lemon grass. good acidity with a fresh taste. A harmonic balance between fruit and wood with a pleasant ending. An elegant wine accompanies very well with various foods. 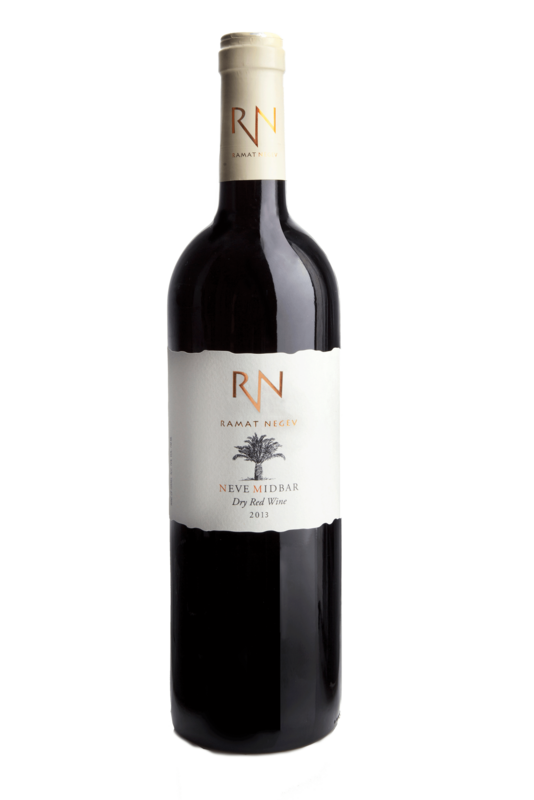 Ramat Negev Winery is the only one cultivated grapes winery in Negev desert, which adhering to the principle of ecological-oriented and protecting the nature and natural resources. It is located away from the pest of poisoned vines, so grapes do not need to spray any pesticides. Desert land directly affect the taste and aroma of wine, the desert temperature difference between day and night is conducive to the accumulation of glucose. Ramon" Collection" - The Vineyards - The manually-picked, harvested grapes are picked early morning and come from a Petit Verdot plot in the Nitzna Vineyard. 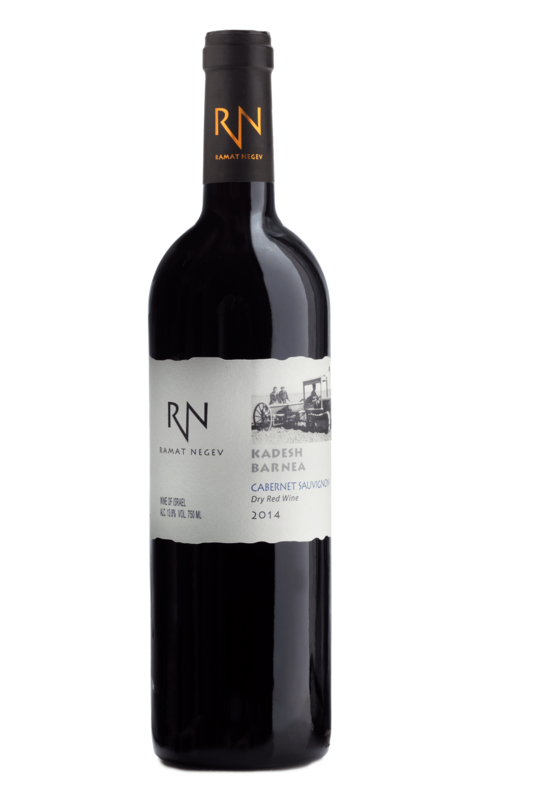 The Petit Verdot plot in Halutza Vineyard is located close to Kadesh Barnea village in the Negev Mountain area, the vineyard is grown on loess soil, sand and lime 300 meters high. The vineyard benefits from the extreme temperature differences and dryness that characterize the desert area. The Winemaking Process - The fermentation process occurs in cold temperature stainless steel tanks in order to preserve the scents and flavors of the fruit. When this process is complete, the wine is soaked on grape peels in cold temperatures for a period of two weeks, to make the most of the aroma and flavors of the peel. After that, the wine undergoes initial decantation and aging for about 18 months in new American and French Oak barrels. Then, the wine is roughly filtered in order to preserve as much as possible the aroma and tastes after which it is bottled and kept in the winery for a period of six months before going on the market. The Vineyards ——The manually-picked, harvested grapes are picked early morning and come from two different winery-owned plots in the Ramat Negev area, both are grown on loess soil, sand and lime 300 meters high. The vineyards benefit from the extreme temperature differences and dryness that characterize the desert area. The Winemaking Process —— The fermentation process occurs in cold temperature in stainless steel tanks in order to preserve the scents and flavors of the fruit. When this process is complete, the wine is soaked on grape peels in cold temperatures for a period of two weeks to make the most of the aroma and flavors of the peel. After that, the wine undergoes initial decantation and an aging process for about eight months in American Oak barrels, most of which are new. Then, the wine is roughly filtered to preserve as much as possible the aroma and tastes after which it is bottled and kept in the winery for a period of three months before going on the market. Characteristics ——Solid tannins and a medium, but closer to full body. The color dark, bold and clear purple color is reached by filtering the wine, stabilizing and closely supervising that it doesn´t get damaged by oxygen. The Vineyards —— The manually-picked, harvested grapes are picked early morning and come from three different winery owned vineyards. The Merlot plot in Nitzna Vineyard. The Petit Verdot plot in Halutza Vineyard both located close to Kadesh Barnea village. The vineyards were grown on loess soil, sand and lime 300 meters high. The Cabernet Sauvignon plot in Avdat Vineyard farm in the Negev Mountain area, on loess soil, sand and red soil, 700 meters high. The vineyard benefits from the extreme temperature differences and dryness that characterize the desert area. The fermentation process occurs in cold temperature in stainless steel tanks in order to preserve the scents and flavors of the fruit. When this process is complete, the wine is soaked on grape peels in cold temperatures for a period of two weeks to make the most of the aroma and flavors of the peel. After that, the wine undergoes initial decantation and an aging process for about 14 months in American and French Oak barrels. Then, the wine is roughly filtered to preserve as much as possible the aroma and tastes after which it is bottled and kept in the winery for a period of six months before going on the market. Characteristics: The wine has a full, rich body, solid tannins and a delicate acidity but does have presence the color deep, bold and almost black purple color is reached by roughly filtering, stabilizing and closely supervising the wine so that it doesn´t get damaged by oxygen. Since its establishment in 2003, the winery has been growing steadily. The winery currently produces nine kinds of wine. In 2015, the output even reached 250,000 bottles, and were exported to many countries. The environment is poetic beautiful. Grapes grow in the natural white limestone platform which is 900 meters above sea level. In 2008, the brewing location moved to the north of Jerusalem, the current site which has 6-minute car driving distance from it. The gold on the wine mark is a replica of the gold coins during the great uprising. This gold coin is found in the excavation of the cave. The cave was later used to put the winery's barrels. In the beautiful building built by the stone of Jerusalem, the winery overlooks the natural stream and opens the door to invite all the tourists to enjoy the food, wine and beauty. 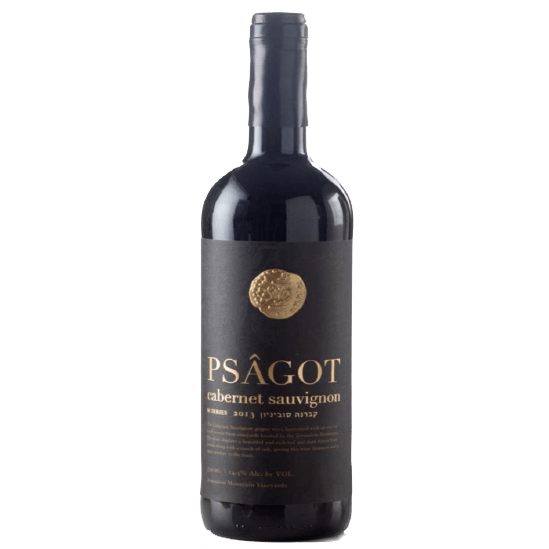 This varietal wine which strives to articulate the singular expressions of Psagot's vineyard. Nestled just north of Jerusalem in the Jerusalem mountains and situated over 900M above sea level, it is terraced on a steep-slop of chalk and Terra Rosa soil. This wine exudes a beautiful fruit profile and has rich concentrated aromas of black cherry and black cuttants which are complimented by a touch of earth and minerals unique to this vineyard. This wine is very approachable now and should develop nicely over the next ten plus years. Grape Varieties: Merlot 65%, Cabernet Sauvignon 16%, Petit Verdot 11% and Cabernet Franc 10%. It is the winery's premier red wine featuring a Bordeaux blend. In making this wine we strive to blend old world Bordeaux with the Jerusalem Hills terroir. The wine is rich and spicy with cedar notes that integrate nicely with intense flavors of berries, black currants and oriental spice all layered on a mineral backbone, this wine is very approachable now and should develop nicely over the next five to ten years. At the foot of the Gamma Valley of Israel, the Morad family built its unique winery, producing all kinds of exotic wines. The natural fruit and herbs make this winery able to produce distinctive wines and liqueurs. The recipe for the production of wine is passed down from generation to generation, which has combined with ancient traditions and advanced technology. Morad winery is very suitable for mixing into a variety of specialty cocktails. Founded in 1999, Morad Winery was inspired by the family recipe. It has developed a lot of high-quality wine. In 2009, the family started to cooperate with the world-class boutique winery. With the love and the pursuit of perfect from the two families, the production of wine is becoming perfect indeed. The products produced by Morad Winery are not only sold in the wineries' shops, but are also sold at Israeli selection of wine shops and chains. Morad Winery's products are also sold to different countries around the world, such as the United States, China and many European countries and so on. Passion Fruit wine is the flagship product of the Morad Winery. The strong aroma of the Passion Fruit, together with the sweet/sour taste, creates a sense of pure pleasure on the palate. The Passion Fruit comes to us from the north of Israel, is squeezed, and undergoes a process of fermentation, after which the wine is aged for at least 12 months in stainless steel vats. 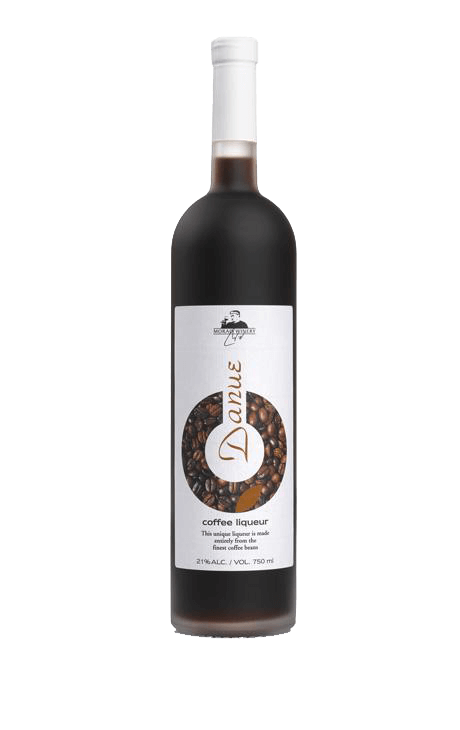 Morad Coffee liqueur is one of the leading liqueurs of the Morad Winery. Please call us at working hours.